Preheat oven to 160°C (325°F). Place the flour, sugar, butter, eggs, milk and vanilla in an electric mixer and beat on medium speed for 2 minutes or until pale and creamy. Spoon the mixture into 12 x ½ cup-capacity (125ml) muffin tins lined with cupcake cases. Bake for 20–25 minutes or until cooked when tested with a skewer. Place on a wire rack to cool completely. To make the cream cheese icing, place the cream cheese, butter and vanilla in an electric mixer and beat for 6–8 minutes or until pale and creamy. Scrape down the sides of the bowl, add the icing sugar mixture and beat for a further 6–8 minutes or until pale and fluffy. Spread the cooled cupcakes with the icing+. To make the panda bear cupcakes, press 3 cupcakes into the coconut. Twist open the cream-filled biscuits, ensuring all the filling stays on one biscuit. Using a small, serrated knife, cut the biscuits without the filling in half. Use the halved cookies to make the ears and mouths. Use the biscuits with the filling to make the whites of the eyes and top with chocolate chips. Use chocolate chips for the noses. 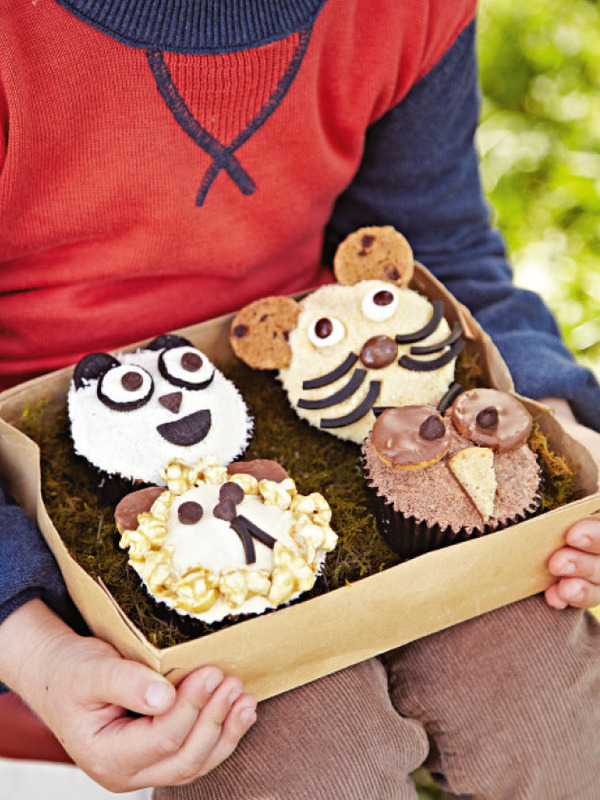 To make the lion cupcakes, arrange the popcorn around the edge of 3 cupcakes to create the lions’ manes. Use the chocolate chips to make the eyes and noses. Use the licorice for the mouths. Press the chocolate cookies into the cakes to make ears. To make the owl cupcakes, lightly crush the chocolate bar and place in a bowl. Press 3 cupcakes into the crushed chocolate. Using a small, serrated knife, cut one biscuit into three triangles to make the beaks. Use the remaining biscuits and the chocolate chips to make the eyes and use the licorice to make eyebrows. To make the mouse cupcakes, place the biscuits in a small food processor and process until fine. Place in a bowl and press 3 cupcakes into the crumbs. Press the choc-chip biscuits into the cakes to make the ears. Halve the marshmallows and use to make the whites of the eyes. Top the eyes with the chocolate chips. Use the chocolate-coated raisins to make the noses and use the licorice to make the whiskers. Makes 12. + You will have a little icing leftover, which you can use to adhere the animal faces to the cupcakes.